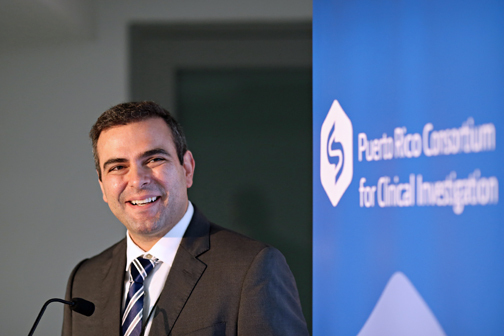 The Puerto Rico Consortium for Clinical Investigation, a nonprofit collaborative of 22 research centers across Puerto Rico, is an initiative created by the Puerto Rico Science Trust to fulfill a critical mission. The PRCCI, established a little less than a year ago, strives to achieve best practices on quality and speed of execution of clinical trials for the benefit of patients, for the retainment of doctors and nurses on the island, and for realizing clinical trial revenues to help the economy by making our members globally competitive. The PRCCI is also a cultural shift much needed in tough times — 22 Puerto Rico organizations, former “competitors,” are collaborating for the common good, to win together. Have a solid sustainability plan toward complete financial independence from the Trust in two to three years. And this is only the beginning. The PRCCI grows and matures by the day. In addition to more members and more studies, the nonprofit is expanding in areas such as needed IT infrastructure for research and patient empowerment. Geographical expansion outside Puerto Rico is also on the horizon, as five different Latin American countries’ organizations have already approached the PRCCI to collaborate by either joining it or having an adapted version of it in their country. We continue to realize clinical trials for several of our members: Nine of our members have now entered into one or more clinical trial agreements through PRCCI, across several therapeutic areas. In June we secured three more clinical trial agreements, which include our third study on Zika and our first in ophthalmology. We are proud to have supported the 1st Hispanics Increasing Diversity to Enhance Advocacy in Science (H-IDEAS) training. PRCCI financially supported the activity and our Quality Director, Stephanie Berger, delivered the GCP/patient rights part of the training. Our partnership with Yale University, which started more than a year ago, just got a lot stronger. The Yale Center for Clinical Investigation (YCCI) is PRCCI’s new external quality partner. YCCI will perform risk-based monitoring visits to our sites that receive studies through PRCCI. This is a tremendous service PRCCI/YCCI is offering to our members as they have us and YCCI as their internal quality advisor, making sure that everything goes well with the site before a potential audit by sponsor/Contact Research Organization (CRO) or FDA. The first batch of YCCI visits will take place in a month. We are promoting clinical research within the island and reinvesting in our clinical researchers. We supported and actively participated in the Puerto Rico Clinical and Translational Research Consortium’s (PRCTRC) Scientific Day which had the theme of: “Clinical and Translational Research 2017. From: Learning to Action.” This is a great initiative by the academic researchers. On July 31st and Aug. 1st we are planning a series of training and community engagement events, together with YCCI. These events include three workshops on clinical research in a hospital setting, use of analytics for site performance, and billing for clinical research. Also, on Aug. 1st, we will host a community engagement event with multiple patient groups/associations and community partners coming together to discuss, assess and integrate their needs, and start working towards common solutions which are critical given the state of the economy. This is only the beginning, year one of operations. I hope we are allowed to fulfill the whole potential of clinical research in Puerto Rico. Hey Buddy!, I found this information for you: "Op-Ed: Clinical research spurring world-class activity". Here is the website link: https://newsismybusiness.com/research-spurring-activity/. Thank you.